The blog has been a little empty as of late. It’s the essay writing time of year. Here’s a review I wrote of the interesting Dying of the Light for CeX. I couldn’t help but post it. Enjoy! Things have been going in a strange direction for Nicolas Cage as of late. The recent Left Behind was possibly the worst film he’s ever been involved in. 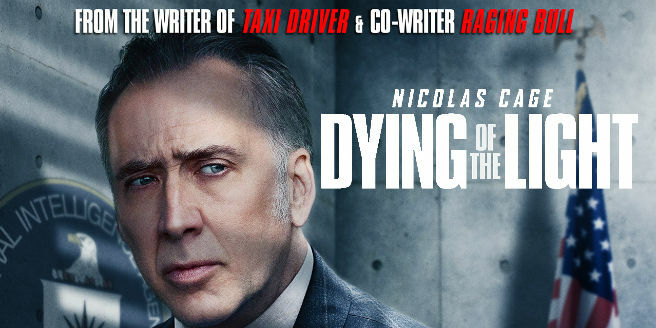 Out now on DVD and Blu-ray, does Dying of the Light fare any better? Before we get stuck into Dying of the Light, we have to talk about the elephant in the room. The elephant called Paul Schrader. Behind the scenes, Dying of the Light was in trouble for a while. Reports of the film being taken away from director Schrader’s control led to him and the film’s stars publicly removing themselves from the film. Ok, these sort of problems usually spell disaster for a film. But some of the greatest films of all time had difficult productions, like Blade Runner, Apocalypse Now or Jaws. On these films it’s not obvious that there were difficulties behind the scenes. You wouldn’t be able to tell unless you looked into it. Is Dying of the Light one of these films? Of course it isn’t! Strap yourself in for a Cagey ride.